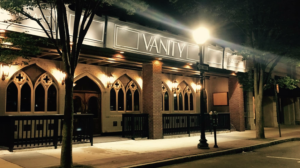 New Haven’s newest hot spot, Vanity Restaurant & Nightclub, wants to raise the bar. The beautifully reconstructed former church on Temple Street has been reborn as students have been raving about the latest addition to the downtown nightlife. Owner John Mocadlo said he noticed the empty space, previously occupied by the Russian Lady restaurant and bar, after getting ice cream at Ben and Jerry’s. 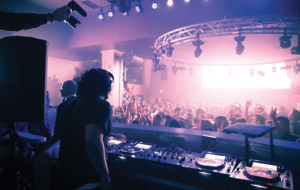 Within months, Mocadlo and his partners began investing in their vision to establish a revolutionary venue unlike any other in Connecticut. Mocadlo and his partners invested roughly $1 million into the 15,000 square-foot space before the Vanity Restaurant & Nightclub opened this past August. The new additions from the renovations are visually stunning and will leave you in awe from the moment you step inside the luxurious venue. Besides attracting a large clientele of party-goers in it’s massive entertainment space, Vanity has become known for its fine-dining options for dinner. 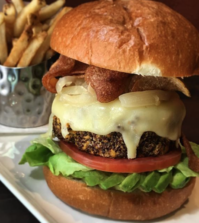 Executive Chef Andrew Fine has certainly made a name for himself amongst food-lovers as he has prepared dishes in an unconventional way that isn’t native to New Haven. Mocadlo says the most popular entree is the Salt Slab New Yorker, a New York strip steak on a salt slab which is blow-torched with sugar on top, leaving customers with a salty and sugary taste in every bite. The Vanity Restaurant & Nightclub welcomes anyone, including families with kids, and generally see’s an influx of people coming for the night life around 10 p.m. 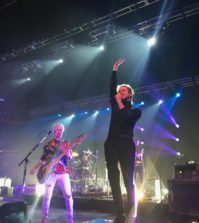 The busy nights generally occur Thursday through Saturday as the venue has created quite the buzz amongst local colleges. Although BAR and Brother Jimmy’s are right around the corner from Vanity, Mocadlo says he isn’t concerned about losing any business. 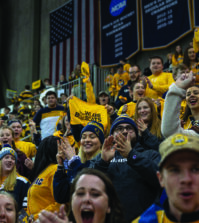 Connor Carey, a senior at Quinnipiac, saw that New Haven was a major city with no big-room nightclub and has been impressed by the quality of the venue. Carey had been waiting with three other friends, all of which had previously been to Vanity for several occasions. The four agreed they go to have fun with the boys to drink, dance and meet new people. Despite being dressed appropriately, Carey and his friends were unaware of the Vanity dress code, prohibiting any athletic wear, baggy clothing, sneakers, hats, shorts, etc. Ashley Mennillo, a senior at Central Connecticut State University (CCSU), was with her friend Lexi Sobireski, a senior at Southern Connecticut State University (SCSU) and bartender at Brother Jimmy’s. The two said it was only their second time at Vanity and their friend, DJ Arian, was performing that night. Both Mennillo and Sobireski said they had been to every spot in New Haven and agreed Vanity is unlike any other venue. 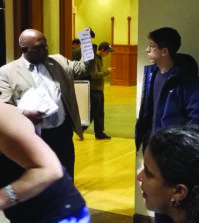 Vanity sees about three thousand people on Thursdays and Saturdays as the staff is often unable to let people in when the space is at full capacity. Like most high-end nightclubs, Vanity has a cover charge, but is reasonably priced as the cost on Thursday nights is five dollars after 11:00 pm. On Friday and Saturday nights, the cover is $20 for an event and $10 normally, but is half the price with a college ID. John Mocadlo’s vision to build a venue that provides the New Haven area with the ultimate restaurant, nightclub and event experience has come true as waves of people have flocked to the venue since it opened in August. Mocadlo says he already has plans to potentially expand to the West Hartford market as customers are capitalizing on the space, leaving the venue amazed by the unique experience.